Lay the pie crust in your pie pan and crimp the edges. In a large bowl, whisk together the yolks until light in color. Add the flour, salt, sugar, nutmeg and cinnamon. Whisk until smooth then add the sour cream and vanilla and stir until evenly combined. 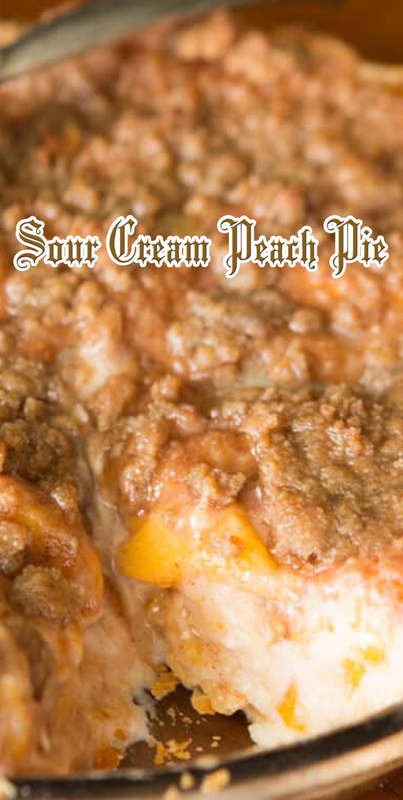 Fold in 3 cups of the peaches and dump into the pie. Place the last cup of peaches in a bowl and toss with the flour, sugar and cinnamon and set aside. Place the brown sugar, flour, butter, and cinnamon in a bowl and using a pastry cutter, cut in the butter then switch to your hands and squeeze together to form clumps of topping. Bake at 400 for 15 minutes, remove from the oven and add the remaining peaches on top. Bake an additional 10-12 minutes, remove from the oven again and add the topping in little clumps all over the pie, returning the pie to the oven for another 20 minutes, covering the crust with foil if needed. Allow to cool on the counter then put in the fridge for 3 hours to set.